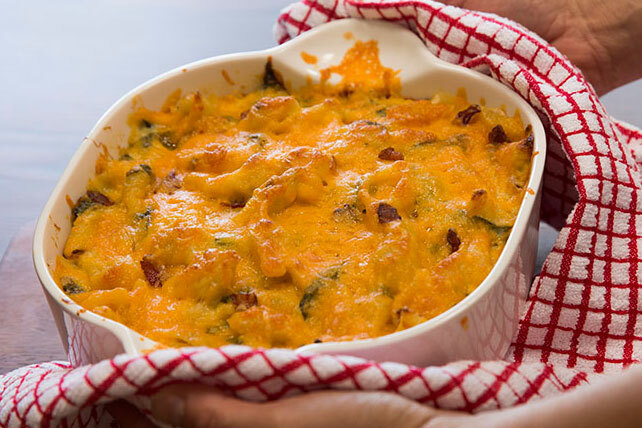 Take mealtime to the next level with this Spinach-Bacon Mac & Cheese Recipe. This smoky Spinach-Bacon Mac & Cheese Recipe is packed with flavor. Meanwhile, cook and stir bacon in large saucepan until crisp. Use slotted spoon to remove bacon from pan, reserving drippings in pan. Add flour to drippings; cook and stir 1 min. or until bubbly. Gradually stir in milk. Bring to boil, stirring constantly; cook and stir 3 to 5 min. or until thickened. Add 1 cup cheddar and Parmesan to saucepan; cook and stir 2 to 3 min. or until melted. Add pasta mixture and bacon; mix well. Spoon into 1-1/2-qt. casserole sprayed with cooking spray; top with remaining cheddar. Bake 20 min. or until heated through. Prepare using fat-free milk and KRAFT 2% Milk Shredded Sharp Cheddar Cheese. Stir 1/2 cup chopped tomatoes into the pasta before spooning it into the prepared casserole.